Days removed from sophomore defenseman Charlie McAvoy and freshman forward Clayton Keller turning pro early, sophomore center Jakob Forsbacka Karlsson has also taken the NHL path. The 20-year-old Swede signed with the Boston Bruins on Sunday evening, foregoing his final two years of NCAA eligibility for life on Causeway Street. Instead of joining McAvoy with the Providence Bruins, “JFK” will join the Black and Gold ahead of their game against the Tampa Bay Lightning on Tuesday night. Serving as an alternate captain during the 2016-17 BU season, he posted 14 goals and 19 assists for 33 points. Notably, the Terriers were 9-0-1 when “JFK” scored as a sophomore, one year removed from being named to the Hockey East All-Rookie Team. 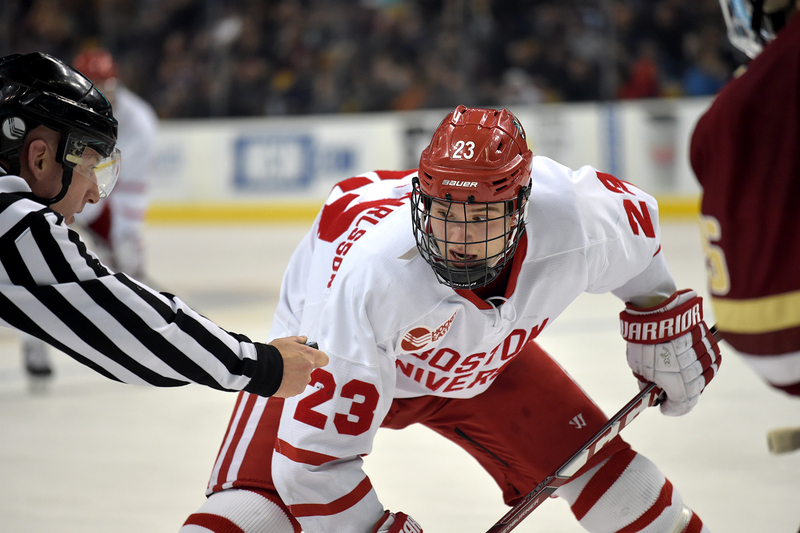 The news comes just days after David Quinn, BU’s head coach, expressed supreme confidence that the Swede would return for his junior season. However, as reported by The Boston Globe’s Kevin Paul Dupont, the Bruins met with “JFK” on Friday and must have convinced him the pro route was in the cards. Mindful of that, he’ll likely try and displace Ryan Spooner or Riley Nash as Boston’s third or fourth line center, respectively. The move also represents quite the vote of confidence, as “JFK,” often likened to Patrice Bergeron, joins amidst a playoff push. Per a release by the Bruins, “JFK” signed a three-year entry-level contract effective immediately. BREAKING: Per Bruins, JFK will join the varsity this week. First practice would be Tues morn, prior to club's Tues eve game vs. TBL. The deal burns off year of JFK's ELC. He reaches his first free-agent bridge come July 2019. Don Sweeney on JFK signing: "Gives us that (NHL) option. We felt comfortable w/his progression if we go down that road that he can help us"
JFK going right to Boston is something. JFK…it's all in the details. He plays the game right- B's are right to be high on him. He will never be a regular on the Bruins. They have NEVER had a BU regular in over 50 years when college hockey players have played in the NHL. Our guys just do not value a BU education. Must change our recruiting somehow.